It marks the first time the United States has designated an entire entity of another government as a terrorist organization, placing a powerful and expansive armed force with vast economic resources that answers only to Iran's supreme leader in the same category as al-Qaida and the Islamic State group. Iran's rival, Saudi Arabia, welcomed the U.S. decision, describing it as a "serious and practical step to combat terrorism." A Foreign Ministry official said the designation "translates Saudi Arabia's repeated demands for the international community to confront terrorism supported by Iran." Within hours of the Trump administration's declaration, Iran's Supreme National Security Council responded by designating the U.S. Central Command, also known as CENTCOM, and all its forces as terrorist, and labeling the U.S. a "supporter of terrorism." Parliament Speaker Ali Larijani denounced the U.S. decision as the "climax of stupidity and ignorance." The Supreme National Security Council's spokesman, Keivan Khosravi, said that going forward, "any unusual move by American forces in the region will be perceived as the behavior by a terrorist group." He did not elaborate. The pro-reform Shargh daily described it as "the last card" of President Donald Trump against Iran. Trump last year pulled America out of the 2015 nuclear deal between Iran and world powers and re-imposed sanctions on the country, mainly targeting Iran's vital oil sector. Marking Nuclear Day, Rouhani unveiled dozens of "achievements" in nuclear technology, something he does every year. This time he touted the beginning of an installation of a chain of advanced centrifuges at the uranium enrichment facility in the central town of Natanz as well as an addition at the Fordo underground facility. He called the Revolutionary Guard a "devoted" force that fought militant groups in Iran as well as in Iraq and Syria. The guard has fought Islamic State group's militants, who view Shiites as heretics, in Syria and has assisted Syrian President Bashar Assad's government forces. 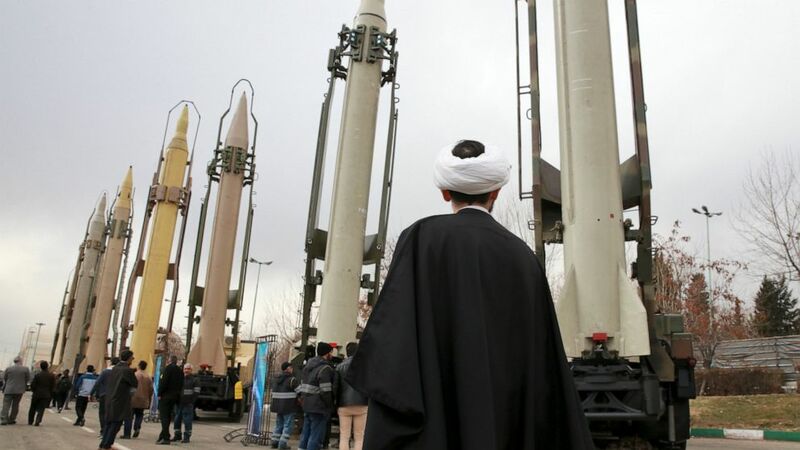 The U.S., Rouhani said, is the "head of global terrorism" and Trump's sanctions have only inspired Iran to make more strides in new missiles and weapons technology. America will not be able to "block Iran's progress," he said. Khamenei, who has final say on all state matters, met with the Guard on Tuesday, telling them that "Americans imagine they are designing and making trouble against the guard, in fact against the revolution and Iran, but their evil designs will not harm" the force. China urged countries outside of the Mideast to "promote peace and stability ... and avoid actions that may lead to further escalation of the situation." Beijing is a close economic partner of Tehran and has sided with Russia and its regional ally Iran in the conflict in Syria. "We oppose power politics and bullying by any countries," China's Foreign Ministry spokesman Lu Kang said when asked about the U.S. designation. Associated Press writers Aya Batrawy in Dubai, United Arab Emirates, and Christopher Bodeen in Beijing contributed to this report.